V-belts are quite common within industry and in various items of machinery and are quite adaptable to many applications. Typically, V-belt drives operate best at speeds between 8 and 30 m/s (1,500~6,000 ft/min). V-belt drives permit large speed ratios, are easily installed and removed, quiet, and low maintenance. However there are some limitations: V-belts will slip and creep, V-belts should not be used where synchronous speeds are required. Pulleys (also known as sheaves) and belts have two uses: to transfer power from one shaft to another, and to increase or reduce speed or torque. This is done by using pulleys of different pitch diameters. The pitch diameter of a pulley is not the outside diameter, nor is it the inside diameter. In fact, the pitch diameter is very difficult to measure directly. If you cut a belt and look at the end, you'll see a row of fibres or cords near the outside surface (see diagram at left). This is the tension carrying part of the belt - the rest of the belt exists only to transfer the forces from the pulley to and from these cords. The pitch diameter of any pulley is measured at these cords. Note that the pitch diameter of a pulley depends not just on the pulley itself, but also on the width of the belt. e.g. 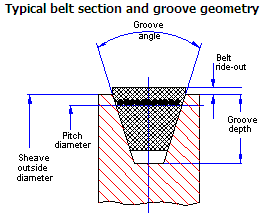 A wider belt on a narrower pulley will ride higher than usual in the groove increasing the effective pitch diameter. There are several standard sizes of V-belts, and the ones used most of our applications are known as 'A', 'B' or 'C' belts. There are other sizes, but these are generally suited to higher power applications. All V-belts have a 40° groove angle between the faces. V-belts are not 100% efficient, however. While they transfer torque effectively, they loose a bit of speed as the belt stretches under load. Sometimes there is slip of the belt on the pulleys, but in a properly set up transmission, there should be NO slip. The tension of the belt should be sufficient to prevent slip. There is creep however, but creep, not to be confused with slip, is due to belt elements changing length as they travel around the pulleys, and since the pulley is rigid then there must be relative motion between belt element and pulley. This is normal operation and expected. In most applications, the pulleys are different effective diameters and the driving speed is different to the output speed. It is the pitch diameter (see above) of each of the pulleys which determine the drive ratio. Note that pulleys no not affect power, when they increase torque, speed reduces, and vice versa. 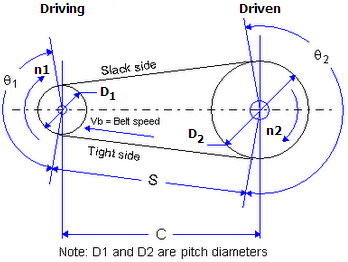 The driving side pulley (connected to the power source) and pitch diameter D1 is at the left and rotates counter clockwise at speed n1. The driven pulley has a pitch diameter of D2 and rotates at speed n2. The wrap angle of the belt on the pulleys is θ1 and θ2. Note that there is a 'tight' side and a 'slack' side to the belt when it is transmitting power, and the difference in the tension between these 2 sides is proportional to the amount of power transferred. Power is typically transferred with the tight side at the bottom. Note however that there must be a static tension in the belt, even when stationary, to provide sufficient friction for the pulley to drive the belt and not slip, and this tension is the same value top and bottom at rest. The size of a pulley is indicated by its pitch diameter (D), which slightly smaller than the outside measured diameter. The centre distance between the shafts is indicated as C in the diagram. The ratio of the pitch diameters is called the drive ratio, the ratio by which torque is increased and speed is decreased, or vice versa. It is the pitch diameter which is used in calculating the effective ratio of the drive in the Speed/gear ratio calculator in lieu of number of teeth. Adjustment for the centre distance must be provided in both directions from the nominal value to set the initial tension. Provision for increasing the centre distance must be made to take up for belt stretch during use. If fixed centres are required, idler pulleys should be used to adjust the belt. Maximum centre distance should be less than 20 times the smaller pulley pitch diameter. The wrap angle on the smaller pulley should be greater than 120°. Belt speed should be <30m/s (6,000 ft/min). Consider an alternative type of drive, such as a gear type or chain, if the belt speed is less than 5 m/s (1,000 ft/min). Avoid elevated temperatures around belts. Avoid contaminants such as oil, grease or grit on the belts. Ensure that any shafts with pulleys are parallel, and the pulleys are in alignment. If an idler pulley or roller is used, it should be installed on the slack side of the belt. It should also be closer to the smaller pulley to maximise the wrap angle of the belt. A typical arrangement is shown at left. The idler pulley position should be adjustable to 1) set the initial tension, and 2) to adjust the tension as the belt ages and stretches during use. It is possible for lower power applications to make a primitive clutch using a belt and an idler. Referring to the diagram just above, the centre distance is deliberately made too large so that the belt slips on the pulleys and no power is transferred. The idler roller is then moved inwards to increase the belt tension until the belt fully engages. While possible, this is a very simple and crude arrangement, but can be effective in some applications. It will require trial and error to align for desired operation, will increase the wear on the belt shortening its life and require more space for the idler movement and operating mechanism. 165 Text and photos Copyright © 2006-2019 SMEX, All rights reserved.